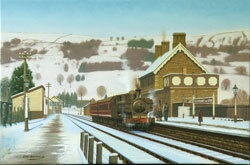 Situated on the scenic Brecon to Newport line, ex-GWR panier tank No. 4611 stands at Talybont station. Sadly it was closed to passengers on 31st Dec 1962. Published as a single limited edition Giclee print. card dimensions 12" x 16¾"